It is almost an article of faith held by national baseball writers and ballpark aficionados that the spring training ballparks in Arizona are far superior to those in Florida. Higher-quality player facilities, expansive outfield berms, 360-degree open concourses, better weather, a more highly concentrated density of parks in the Phoenix area (as opposed to being spread across the state, requiring long commutes from park to park), and perceptions that the ballparks are newer in the Valley are commonly cited reasons for this conventional wisdom. I would have agreed mostly without qualification before this decade, but parks in Florida have made great advances in the 2010s. Out of the 13 Florida parks, six have been completely overhauled through multimillion dollar renovations this decade 1, and two parks are new. On the other hand, there has only been one extensive ballpark renovation in Arizona this decade 2 (not counting the four-year piecemeal approach in Peoria). The ballpark competition between Florida and Arizona spring training is much closer than conventional wisdom would have you think. Spring training facilities throughout Florida have markedly improved throughout this decade. The dramatic transformation of the Orioles’ Ed Smith Stadium in Sarasota captures that fact. Even before the series of ballpark renovations seen across the Sunshine State, Florida facilities also had something Arizona parks could never have: an enduring sense of history with a higher level of intimacy. Throughout this article, I want to go through each ballpark category and outline which state has the upper hand in spring training ballparks. I believe I’m uniquely qualified to do this. I have been to spring training 19 consecutive years, but I went to Arizona spring training for only the third time last week. I usually go to Florida, as I have stronger ties there, but this moment is ripe for a comparison just after coming back from Arizona. I was surprised how not much had changed at Arizona’s spring training parks this decade, while Florida has undergone a pretty dramatic transformation. First, I want to outline the broad generalities of the parks in Florida versus Arizona. Florida spring training has a higher variance in quality from ballpark-to-ballpark, as there are a couple of parks (one in particular) that are just downright inadequate for a professional baseball team in 2018. On the other hand, all parks in Arizona are acceptable. Arizona still has the best spring training ballparks, including the three best overall. The spectacular Salt River Fields at Talking Stick is shown here, which has a legitimate claim for being the best ballpark in the country, not just in spring training. To hammer this point home, 4 of the top 5 spring training facilities in baseball are in Arizona. But 6 of the top 10 are in Florida, meaning the #6-#10 spots in the rankings are occupied by Florida parks. I’ll release the complete rankings/ratings at the conclusion of 2018 spring training. So look out for that next week if you’re curious about the specifics. 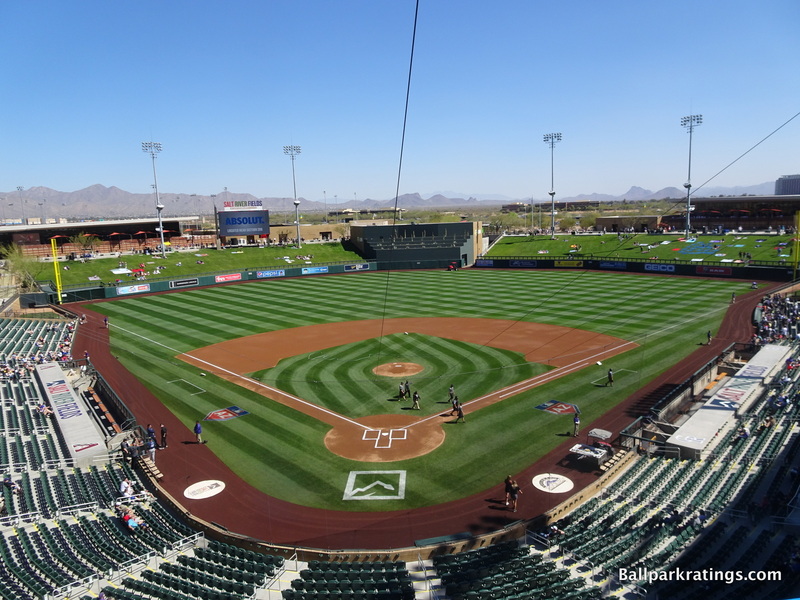 To sum it up, Arizona is more top heavy with a few spectacular parks (Salt River Fields at Talking Stick and Camelback Ranch, for example, are some of the best ballparks in the country, spring training or otherwise), rounded out by good or acceptable ones. Florida ranges from many “very good/great” ballparks, a number of good or acceptable ones, and a couple of inadequate ones. Alright, now I’m going to go category by category comparing the Cactus League to the Grapefruit League. I’ll go in order using the spring training review rubric: starting with setting and ending with amenities, while also mentioning some random tips I usually don’t include in formal reviews. Some of this is common knowledge among those who make the annual trek down south for spring training in either state, but there are also some novel observations. The locations of the spring training facilities are vastly more convenient in Arizona. What is so great about Arizona spring training is that all of the ballparks are highly concentrated in the Phoenix metropolitan area, while teams train all across the state in Florida. This means it is fairly easy to do a double header, seeing both a day game and a nightcap in the same day. In fact, we had our most ambitious schedule ever this year, seeing 10 games in 5 days and 14 games total in a little over a week. Just look at the maps. With the exception of the Atlanta Braves (and this will change in 2020), all teams play on or near the coasts of Florida, either concentrated up and down the treasure/gold coast to the east or the gulf coast to the west. For the Astros in West Palm Beach to play the Blue Jays in Dunedin, the bus ride is 217 miles! On the other hand, the farthest distance in Arizona is from Surprise in northwest Phoenix to Mesa in southeast Phoenix, at only 47 miles. (Hat tip to Graham Knight at springtrainingconnection.com for these mileage numbers). The interior aesthetics are generally much more attractive in Arizona. It’s much harder to find a spring training park in Florida that you could plausibly call “aesthetically inclined” compared to Arizona. Part of this is simply due to the sheer amount of money pumped into the interior landscaping, but I think a large part of this is the outfield berms seen across the Valley. With no outfield concourse much of the time, you are just staring at “dead space” at many Florida facilities. In addition, Arizona parks have the mountain views. Camelback Ranch in all of its glory. Do others not find the ranch aesthetic as attractive as I do? Perhaps some view it as too garish. Regardless, the Cactus League facilities generally have stronger interior aesthetics than the Grapefruit League overall. Most importantly, almost every park in Arizona has a conscious design theme or an aesthetic anchor. Camelback Ranch (Dodgers and White Sox) has a rustic ranch motif, which is quite frankly incandescently brilliant, in the sense that it’s so clever it overwhelms your expectations. The creative color scheme, with its rustic brown façade and caramel colored seats, gets me every time. Outfield clubhouses are positioned with great dexterity to provide for optimal mountain views. Decorative walls in the outfield are made of rocks inside a mesh wire, which not only contribute to the desert ranch theme, but are also inexpensive and environmentally friendly. And it’s not just Camelback Ranch, even though that park is generally emblematic of the creative designs seen throughout the Valley. Salt River Fields at Talking Stick (Diamondbacks and Rockies) takes the gorgeous southwestern motif and puts it on steroids. Sloan Park (Cubs) has Wrigley’s greenery on the batters’ eye, Wrigley’s light towers, and Wrigley’s rooftops. Scottsdale Stadium (Giants) uses a colorful array of landscaped trees to bolster its aesthetic scene. While not my cup of tea, Goodyear Ballpark uses an industrial theme on the inside intended to evoke Ohio (the Reds and Indians train here). Surprise Stadium possesses a charmingly understated, Churchill-downs style press box meant to evoke the South (for the Rangers and Royals). Tempe Diablo Stadium (Angels) has the captivating buttes beyond left field. Even a weaker complex like Maryvale Baseball Park (Brewers) has a “capital M” minimalism aesthetic. There aren’t as many creative interior designs in Florida. 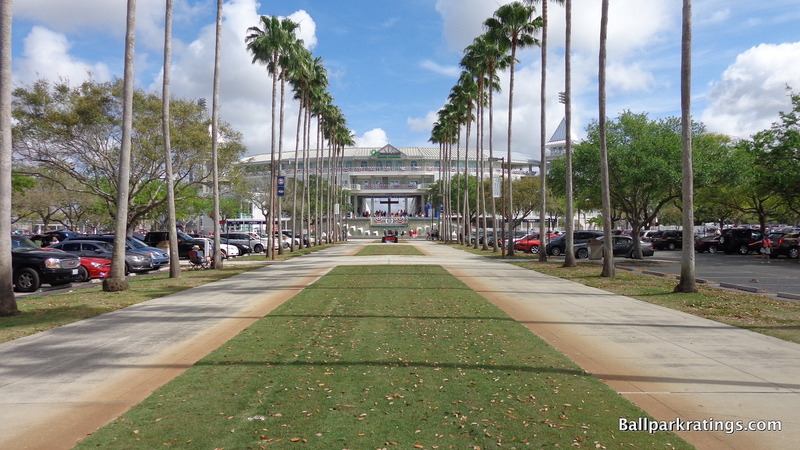 You could point to JetBlue Park’s (Red Sox) undulating roof mimicking the Cypress trees in the distance, in what is probably the most architecturally distinct interior the Grapefruit League. You could site others, but it doesn’t compare to the depth of creative interior aesthetics seen in Arizona. Putting aside a few outliers in Arizona, the exterior architecture has similar merits in both states, but I’d give Florida the slight edge overall. Exploring the grounds outside of Camelback Ranch will take more than an hour, but it’s worth it. Anchored by a two-acre lake past the centerfield entrance, the exterior of Camelback Ranch more strongly resembles a local country club or a 5-star Scottsdale resort than a ballpark. That isn’t overstating it. 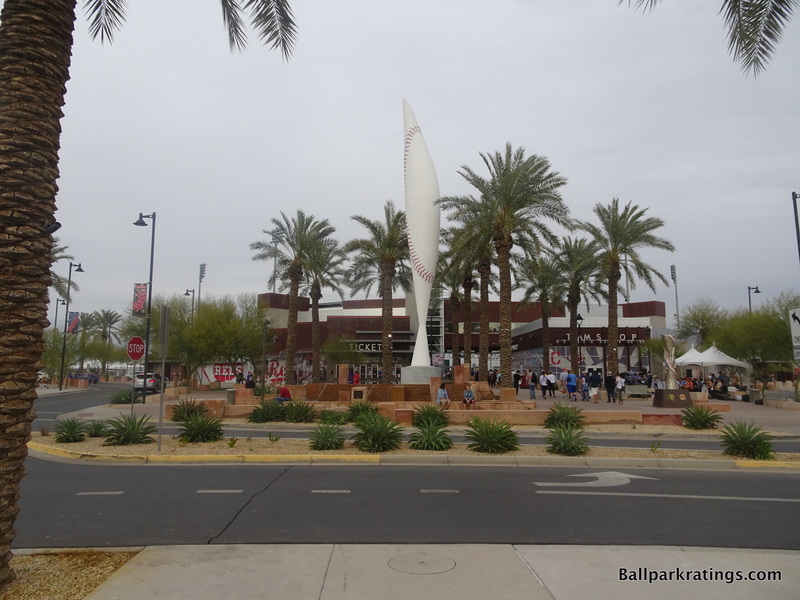 Goodyear Ballpark has one of the more interesting exterior designs in spring training, anchored by a spherical baseball sculpture and a small fountain. Goodyear Ballpark is one of those facilities where the outside is way more attractive than the inside, which is pretty silly when you think about it. Atop a reflecting pool stone fountain behind home plate, a captivatingly novel baseball themed sculpture called “The Ziz” anchors the ballpark’s exterior design and sets the tone for the ballpark’s “like no other” mantra. The $450,000 steel and fiberglass creation is remarkably creative, fusing the concept of flight (in reference to the nearby commuter airport) and baseball. It essentially looks like a malleable baseball was reshaped into a circular spire. 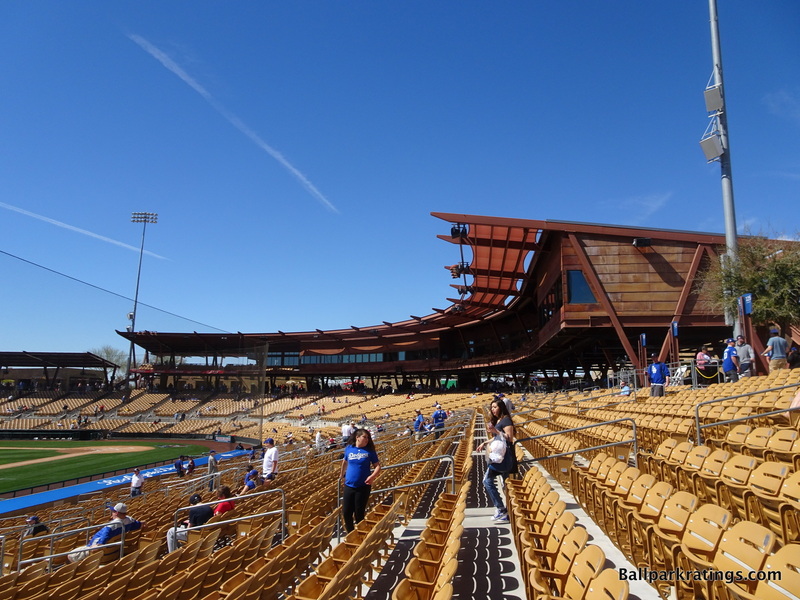 Salt River Fields at Talking Stick’s exterior design is also nice, but other than the two sited above, I think Florida’s spring training parks have a slightly stronger showing in this category. 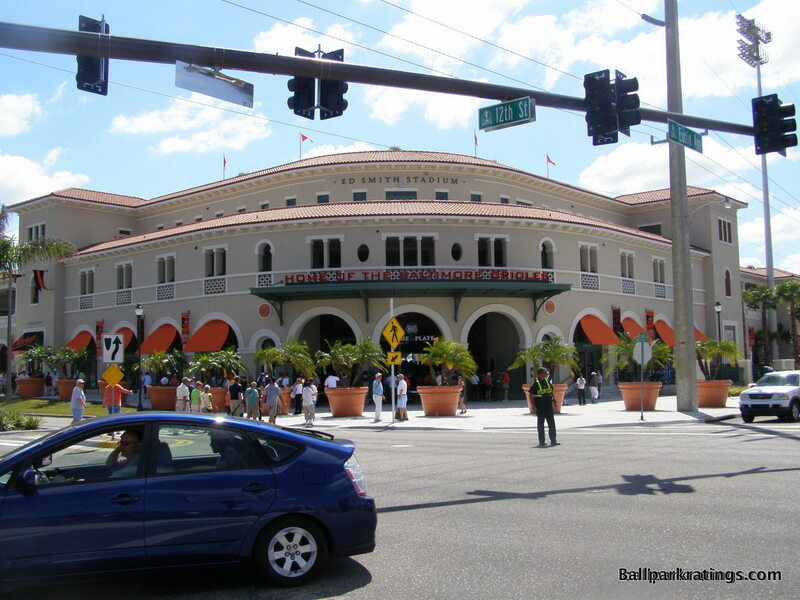 The Orioles’ Ed Smith Stadium in Sarasota features Florida’s best exterior, using a Spanish Mediterranean design with soft stucco and decorative clay. Ed Smith Stadium features a Spanish Mission exterior design typical of Florida spring training ballparks. Disney’s Champion Stadium (Braves) has a similar design, but is probably more creative. While focusing on the regional design traditions expected in Florida, the ballpark also took elements of Californian and Mediterranean architecture, with a touch of Art Deco. Adorned with cream stucco walls, Italian columns, arcades, and even mini-balconies, the facade is infused with faux Etruscan blue tiles, all of which evoke more of a Mediterranean design than Spanish Mission. Opening in 1997, this set the bar high for spring training ballpark exteriors, one that some think has never again been reached. A number of other parks throughout Florida, such as Publix Field at Joker Marchant Stadium (Tigers) and Spectrum Field (Phillies), feature attractive Spanish Mission exterior designs. Known for its dramatic palm tree entrance and fountain, the Twins’ Hammond Stadium in Ft. Myers was a pioneer in constructing attractive ballpark facades, beyond even just spring training. Opening in 1991, it was a concept. Churchhill Downs meets Fenway Park meets Old Florida. New ballparks weren’t concepts. It was attractive, characterized by white lattice windows with green awnings and archways below spire topped roofing. The almost disarming pomp was accentuated by a fountain and palm tree landscape. New ballparks weren’t attractive. People really hadn’t seen anything like it from a ballpark, much less a spring training ballpark. Hammond Stadium’s grand entrance was the beginning of a series of spring training and minor league ballparks with more attractive facades. Arizona spring training ballparks parks are much bigger, while Florida ones are much more intimate. I’m not going to assign a value judgement to this, but it should be noted. Sometimes we like big. Sometimes we like intimate. Being both big and intimate is tricky, and only a couple parks in spring training are able to pull that off. Spring training ballparks in Florida are generally older and more intimate. The Pirates’ LECOM Park in Bradenton is shown here. In Florida, seating capacity ranges from 5,510 for the Blue Jays and 11,000 for the Yankees. Only two parks eclipse the 10,000 mark in the Grapefruit League. 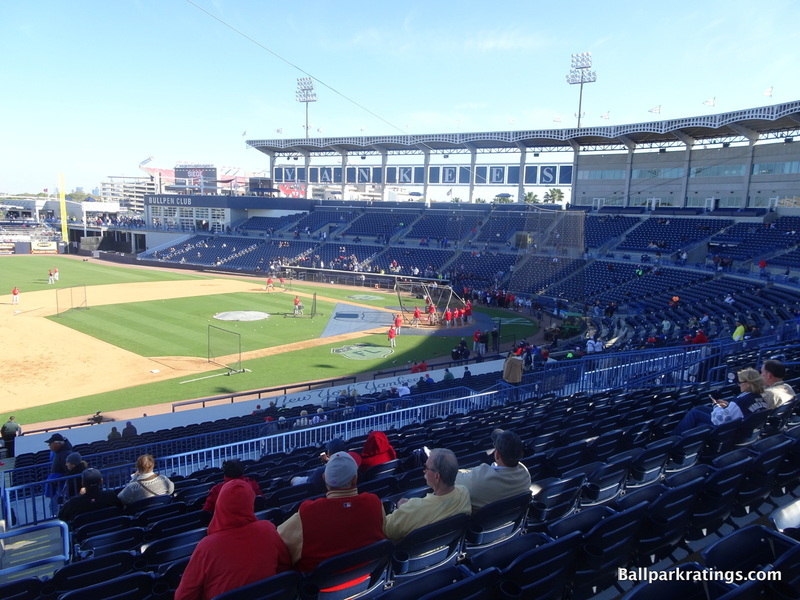 Really, the highest two (Yankees and Red Sox) are obviously not indicative of the typical Grapefruit League facility, as new parks being built in Florida range from 7,500-8,000 (new Braves 2020 complex). On the other hand, only two spring training parks in Arizona don’t have a capacity of over 10,000. And one of them, Tempe Diablo Stadium, is just shy of 10,000. With a capacity of 8,000, only Maryvale Baseball Park for the Brewers has a capacity similar to the parks found in Florida. Capacities in the Cactus League ballparks range from 8,000 to a whopping 15,000 for the Cubs in Mesa. The concourses are vastly superior in Arizona, which basically translates to more space. This is one of the most commonly cited reasons for the claim that the Arizona spring training parks are superior to the ones in Florida. Most have tons of space with concourses that wrap all the way around the field and sport great views of the playing field. On the other hand, many Grapefruit League parks don’t utilize 360-degree systems that allow you to wander into the outfield, and the vast majority don’t have open concourses. 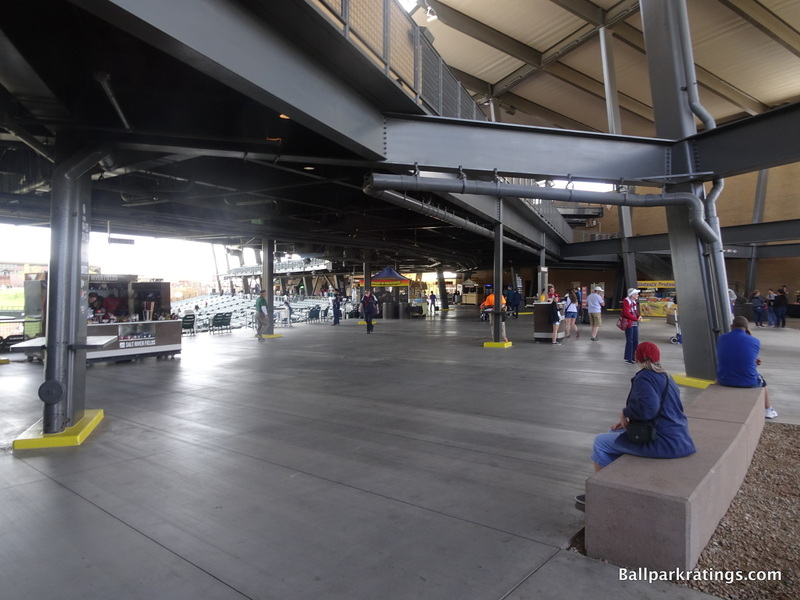 Wide, open attractive concourse at Salt River Fields at Talking Stick. 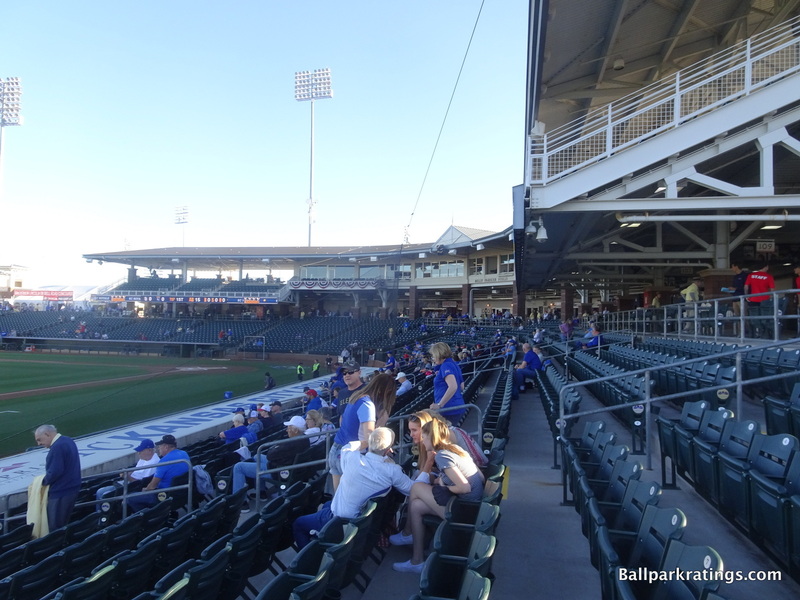 9 out of 10 Cactus League ballparks have a 360-degree concourse with lots of fan-friendly space beyond the outfield, and 7 out of 10 have open concourses providing field views. In Florida, 7 out of 13 have a 360-degree concourse, and only 2 out of 13 have an open concourse. While this is generally the reason Arizona parks are said to be better, what matters is what you do with that space, as a number of creative spatially constricted Florida parks have shown us. Maryvale Baseball Park, for instance, has an open 360-degree concourse, but activity is dead beyond the outfield in that space. Ed Smith Stadium (Orioles) in Sarasota has a closed concourse that does not extend to right field, but is filled with some of the best amenities in all of spring training, including a climate-controlled eatery, a climate-controlled bar, a number of beautiful picnic areas, and numerous spaces to sit down and relax before the game. Concourses are the single biggest advantage Arizona parks have over Florida ones, and while it’s important, it’s probably a little overrated. With the exception of a couple of inadequate parks in Florida, the seat comfort, sightlines, and scoreboards are similar. While attendance is higher in Arizona by virtue of the larger parks, fan support is similar in both states, disregarding a few strange bedfellows in Arizona. Not surprisingly, the best snowbirds in the Grapefruit League belong to the Red Sox and the Yankees. Looking at spring training attendance history, the Twins are also up there, and arguably the most inelastic to team quality of all the teams in Florida. I tried to postulate why this is in my Hammond Stadium review under “Fan Support,” but I’m still not really sure. Compared to other, small to medium market teams in the North, why do Twins fans travel more for spring training than others? Some similar markets have never reached the Twins attendance levels regardless of team quality, despite trying out multiple spring training locations in some cases (Indians). Is the location in Fort Myers that big of a draw? Did Twins fans fall in love with the strong sense of place associated with Hammond Stadium? Was there a significant desire to see their Twins play outdoors in contrast to the Metrodome (pre-’10)? Or is the contrast that stark in Florida compared to the snowy winters in Minnesota? Perhaps the Twins’ fan base is just that good. Anyway, I digress. Historically speaking and in recent years, the Tigers, Braves, Orioles, Phillies, and Braves are also well supported. Both the Marlins and the Astros have never drawn well, the former being for obvious reasons, while the latter probably has something to do with a lack of need to take refuge from a harsh winter climate, as the Rangers have never drawn well in spring training either despite strong fan support in Arlington. In the Valley, the Cubs and the Giants indisputably have the strongest level of fan support, especially evidenced by ticket demand. The Dodgers, Diamondbacks, Rockies (after they left Tucson), and Mariners also have a good reputation for strong fan support during spring training. However, the Cactus League has more bottom feeders (not necessarily evidenced by raw attendance numbers because the ballparks are bigger) than Florida, mostly by virtue of Midwestern teams training so far from their home cities in Phoenix. Reds, Brewers, White Sox, and Indians games have traditionally been snooze fests. In general, tickets on the secondary markets are way cheaper for Arizona spring training, and generally cheaper overall. I don’t take into account pricing when rating the ballparks (at all, for reasons articulated in the “criteria and methodology” section), but I thought I’d mention it here anyway. It was pretty amazing to find tickets in the first row behind the dugout for high-quality matchups throughout the Valley for around $25-$35. The true outliers were the Giants in Scottsdale and the Cubs in Mesa, both of which had ticket prices in the hundreds (for most games, not just marquee matchups) rivaling those in Tampa for the Yankees. Plenty of good, affordable seats available at Surprise Stadium. This is anecdotal, but we went to a night game at Surprise Stadium (Rangers and Royals facility) where we bought single game tickets first row behind home plate (camera seats) for face value off the Royals website, and the two guys to our left and the couple sitting to our right both said they did the same. How is it possible that almost the entire first row squarely behind home plate aren’t sold as season tickets? I know it’s the Royals in a new rebuilding era, but if those aren’t season tickets, do they sell any season tickets? My assumption is that they are season tickets for the Rangers games. Anyway, something like that could never happen in Florida. Yankees, Red Sox, Tigers, Blue Jays, Phillies, and Twins tickets are pretty expensive. The one exception is the Rays at Charlotte Sports Park, for some reason, where tickets are always affordable on the secondary market regardless of attendance. Overall, perhaps the smaller seating capacity is leading to limited supply driving up ticket prices in Florida. Florida parks do a much better job representing the teams that play in them. This is a big deal for me, and why I cobbled together a subjective category for ranking spring training ballparks called “ballpark personality” which kind of combines things like design features that recall the region of the team that plays at the ballpark, team customs, historical references, local foods, etc. Think of aspects like ballpark color scheme, the Yankees’ mini-monument park at Steinbrenner Field in Tampa, the Brewers’ Sausage Race at Maryvale Baseball Park, and local Philadelphia cheesesteaks at Spectrum Field in Clearwater. When I walk into a spring training facility, I want to immediately know who plays there. It’s something almost universal at Major League facilities, but lacking in spring training complexes, probably because of the team sharing phenomenon and the fact that these facilities are used by MLB teams for one month a year. This is perhaps where the polarity is greatest between Arizona and Florida: almost every Arizona park fails here, while most Florida parks succeed. With its Arizona version of the Wrigley Field marquee, Wrigley Field light towers, and Wrigley Field rooftops, Sloan Park screams Chicago Cubs. Two, maybe three, succeed in this category in Arizona. 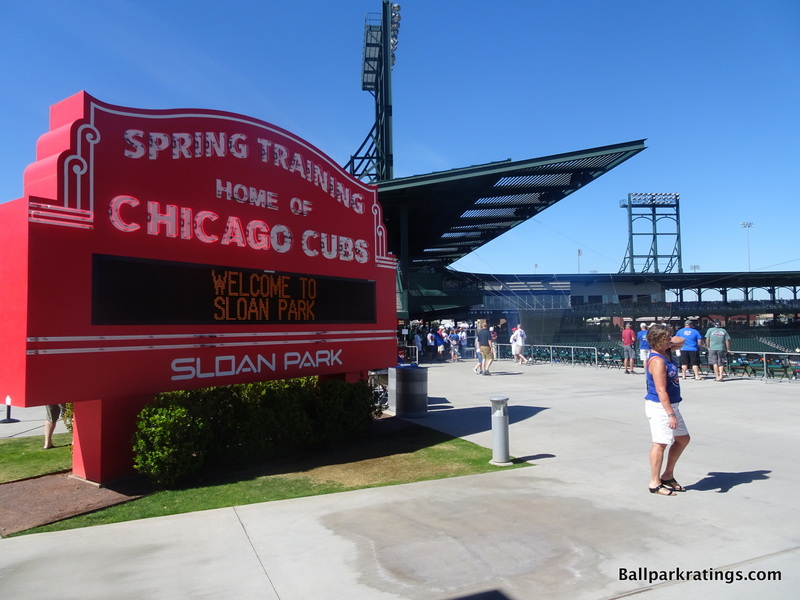 The first is rather obvious: the Cubs’ Sloan Park, which is a Wrigley Field mini-me. It’s very well done in that respect, and I look forward to writing about it. The second ballpark provides a fantastic example of how to do this correctly: the Oakland Athletics’ renovated HoHokam Stadium. No, it’s not a top tier spring training facility, but it sure as hell screams Oakland Athletics. After undergoing full-scale renovations for the Athletics in 2015, the new “HohoKam Stadium” is a breath of fresh air, with a strikingly distinct new color scheme of greens, golds, and greys. I don’t think there’s a space here that’s not one of those three colors, and it’s a wonderful sensation. Not only do the colors perfectly capture the Oakland Athletics, but there is a team reference at every corner. Team themed concessions, murals, party areas, and kids’ features galore. The third park I’m thinking of is the Brewers’ Maryvale Baseball Park, which doesn’t really reflect the team design-wise, but I love that they brought in local features like the Secret Stadium Sauce, Klement’s Brats, and the Sausage Race. All of the other parks in the Valley, no matter how visually spectacular or functionally superior, are vaguely “state-of-the-art” and don’t do enough to reflect the teams’ cultures. There’s been some improvement—little things like Cincinnati’s Skyline Chili in Goodyear, murals showcasing the history of spring training in Tempe at Tempe Diablo Stadium, or the classic San Francisco feel at Scottsdale Stadium—but it’s not enough. Yankee Stadium frieze and Yankees windscreens at Steinbrenner Field. Florida spring training ballparks do a much better job representing the teams that call them home. Florida spring training facilities succeed across the board here. Steinbrenner Field is a Yankee Stadium mini-me. JetBlue Park emulates Fenway to a tee. Dating back to 1923 and having by far the largest Wikipedia page for a spring training facility, the Pirates’ McKetchnie Field LECOM Park is Florida’s Fenway. Publix Field at Joker Marchant Stadium is, well, Tiger Town. 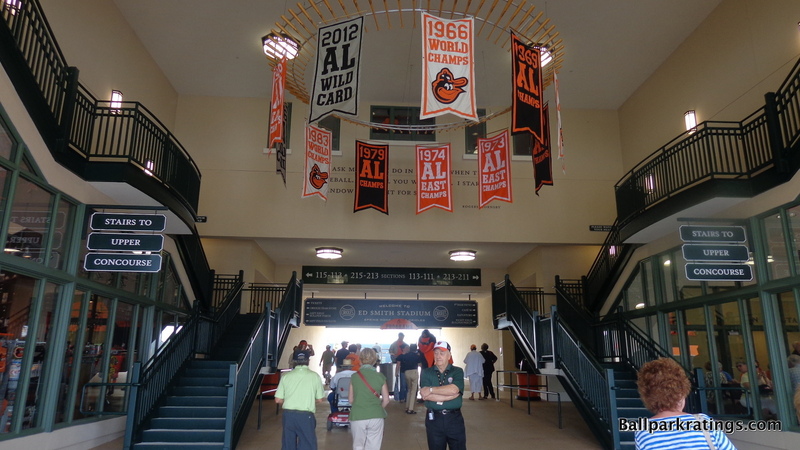 The Orioles’ Ed Smith Stadium is littered with team references, highlighted by a grand chandelier of Oriole bats and pennants and a café named to honor the year Major League Baseball returned to Baltimore in 1954. The hardest trick to pull off is simultaneously representing the team that plays in a park and representing the sensibility of the state in which the ballpark is located. Sure, it’s great that Steinbrenner Field says, “New York Yankees,” but you’d like it to represent Florida too if possible! That’s what makes the Phillies’ Spectrum Field so brilliant. The Phillies succeed more than everyone else at fusing the sensibility of their home city and Florida. Spectrum Field is a flavorful amalgamation of Floridian Mediterranean architecture and Philadelphia Phillies reds and blues. It’s Florida meets Philadelphia in the best articulated way. All of these places in Florida, including many I didn’t list because this is getting a bit too exhaustive, have a distinct and endearing character beyond just being “state-of-the-art,” and I really appreciate that. Arizona parks are probably more fan-friendly for autographs and seat hopping. A lot of this is anecdotal, and this is an issue on which I’m not really an expert, so I’ll defer to springtrainingconnection.com for any autograph advice. But my general sense is that autographs are easier to come by in Arizona because the surrounding complexes are so well-integrated with the fan experience. With parks like Camelback Ranch and Salt River Fields at Talking Stick, you can meander through the practice fields, watching minor league players practice before reaching the ballpark. 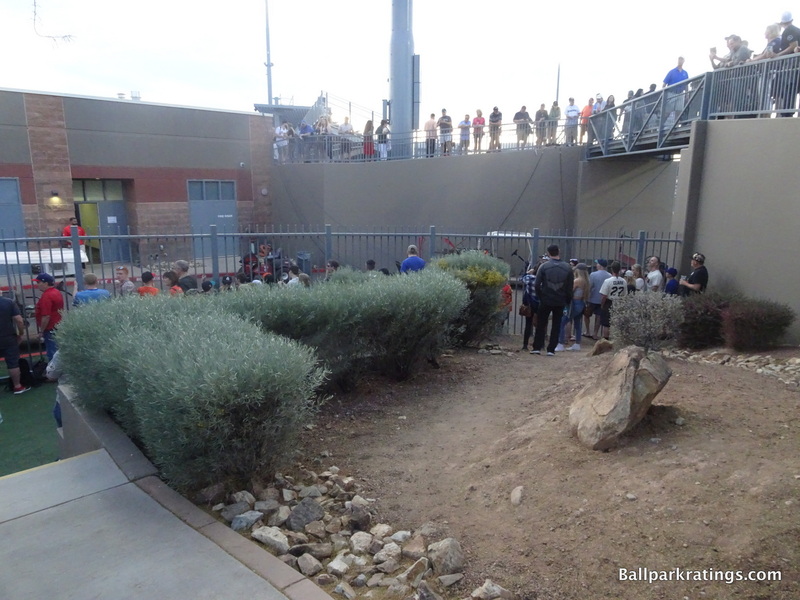 Also, parks like Peoria Sports Complex (Mariners and Padres) have “autograph alleys” with fantastic opportunities for fan-player interaction. Peoria Sports Complex Autograph Alley. My sense is you are also much less likely to get your ticket checked in Arizona when finding your seat. We had literally the best seats in the park for many games, and our tickets were not checked once for the 14 games we attended. The obvious exception is for premium or group areas. This is a far cry from a situation like Publix Field at Joker Marchant Stadium or (especially) Steinbrenner Field, where they don’t even allow you into the lower bowl behind home plate before the game to watch batting practice if you don’t have a ticket in that area. The variety and quality of the concessions is much better in Arizona, and amazingly consistent. This was one of those things you can’t know until you go, but I was impressed with the quality and selection of the food options across the Valley, and surprised by how consistent they were from ballpark to ballpark. It was difficult to distinguish. The parks presented a solid array of options consisting of subs, Mexican, Asian (Island Noodles is a staple throughout many of the parks), BBQ, specialty sandwiches, fish tacos, pork tenderloin, local food trucks, and in some cases, something as exotic as Salvadorian cuisine. Some are certainly better than others (Peoria Sports Complex is generally regarded as having the best food in all of spring training), but there wasn’t really a weak link here. I don’t think I’d give below an 8/10 to any ballpark. 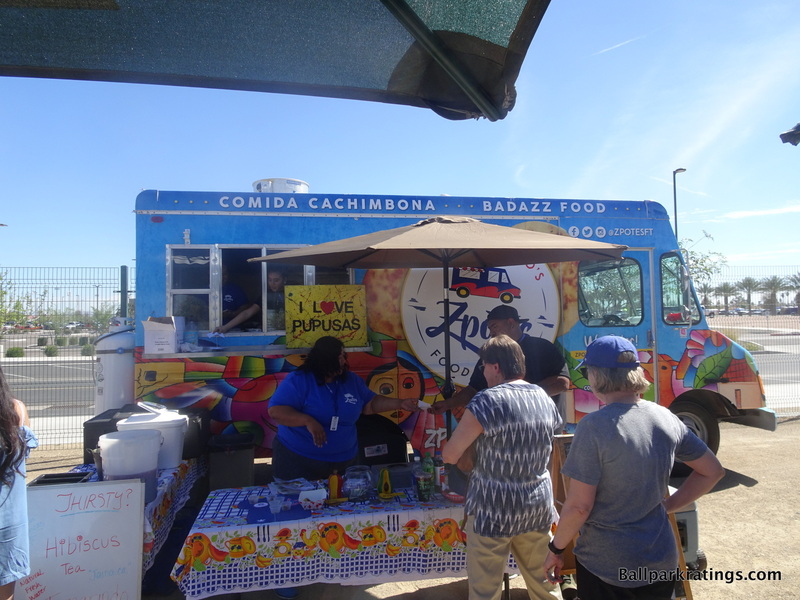 Unique Salvadorian food truck at the Cubs’ Sloan Park. While there isn’t anything this exotic at other parks across the Valley, the food throughout Arizona spring training is remarkably consistent. In contrast, Florida has a much higher variance from park to park in their food options. On one hand, you have a place like the Phillies’ Spectrum Field which showcases local Tampa restaurants like Pete and Shorty’s, Westshore Pizza, and Tijuana Flats. They also bring in Philadelphia oriented options like Delco’s cheesesteaks and (at least in the past) Tony Luke’s. Now that’s importing Philadelphia to Florida! On the other end of the spectrum, you have a place like Disney’s Champion Stadium, which is honestly transcendental in its awfulness. In general, stadium food will fall into three categories, with considerable overlap within a stadium: brand name mall food (think McDonald’s, Taco Bell, Pizza Hut, etc. ), generic stadium food provided by food service corporations (think Aramark, Centerplate), and higher quality local food (think food stands by local eateries at jetBlue Park and Peoria Sports Complex). This is almost always the case. Champion Stadium is the first park I’ve ever seen that has delved way beyond the relative abyss of mall food or stadium food corporations, into something akin to movie theatre food. This isn’t anecdotal. You can see the menu in my review. A 6/10 was generous. Some older parks like Dunedin Stadium for the Blue Jays just serve up the basics: hot dogs, hamburgers, and the like, but at least they’re grilled. Even the food selection at a renovated park like the Pirates’ LECOM in Bradenton doesn’t eclipse that found at any Cactus League park. Anyway, the food selection and quality is generally better and much more consistent from park to park in Arizona. Since Spectrum Field pioneered the outfield “tiki bar” concept in 2004, Florida spring training’s bar game has been way ahead of that of Arizona. Other than the somewhat nebulous “ballpark personality” deficit, this has traditionally been where Arizona is most behind Florida. Frenchy’s Tiki Bar at the Phillies’ Spectrum Field. 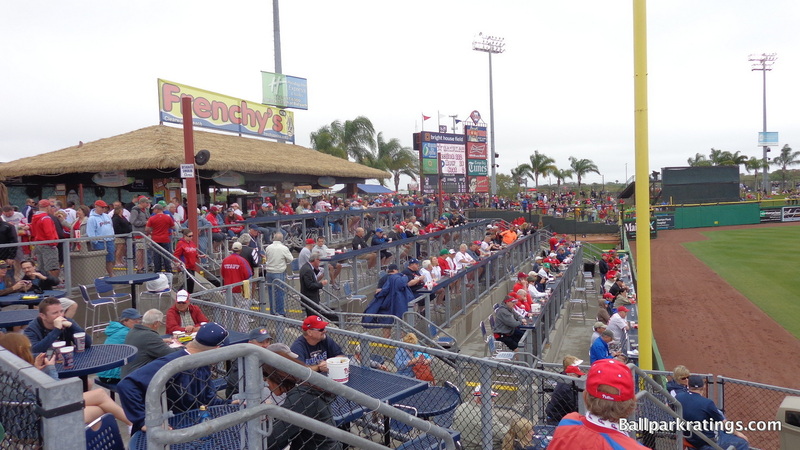 A large number of other Grapefruit League ballparks have incorporated destination bars into their experiences. Tempted by enticing pre-game drink specials, the idea was millennials on spring break would buy general admission tickets and hang out at the outfield bar while watching the game and socializing with friends. This turned out to be a huge success and a nice cash cow in Clearwater, and the concept has been emulated throughout Florida. These are full-service, sit down bars. Tabs. Shots. The whole nine-yards. The atmosphere you might find in a Florida college town. Some parks even keep the bars open after the game. 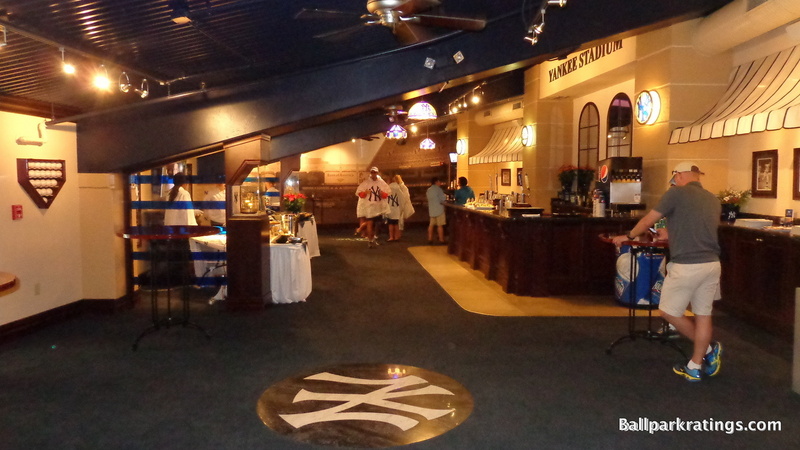 The elaborately themed bar concept was copied by First Data Field (Mets facility, 2004, and a second bar in 2012), Charlotte Sports Park (2010), LECOM Park (2013), Hammond Stadium (2015), Publix Field at Joker Marchant Stadium (2017), and Steinbrenner Field (2017, a right field bar complemented by two bullpen club bars open to all fans). Ed Smith Stadium (2011) might have added the most interesting one, an upscale climate-controlled bar called the Third Base Lounge, although it is not always open to all fans. Ed Smith Stadium has one of the few spaces in spring training that could be categorized as a restaurant, the climate-controlled Café 54. None of this existed in Arizona when I went in 2011, but as of 2018, four parks have stepped up their bar game despite most of them not equaling the scene in Florida. The Jim Beam Bourbon Bar at the Cubs’ Sloan Park. While the bar scene at Wrigleyville West comes the closest, the social scene is stronger at the Florida spring training parks. Goodyear Ballpark added a much-needed sit down bar in right field called the Budweiser Brew Haus. For a park with so much potential but so devoid of activity on the inside, this was a wise addition. The ballpark offers great pre-game specials. Camelback Ranch probably added the most extensive sit-down bar down the first base line called Four Peaks. It’s a legitimate place to hang out before, during, or after the game. Given the lack of shade at Camelback, I can see this being a popular spot. Peoria Sports Complex added a bar called the Four Peaks Pavilion. While there are no sit-down areas, it functions as a nice social space given the level of activity. Finally, the Cubs’ Sloan Park has the most vibrant bar scene in the Valley and is the only one that rivals any of the Florida spring parks. Replete with rustic Adirondack chairs, bar stools, and Jim Beam barrels, my favorite is the new Jim Beam Bourbon Bar, recently added in the left field corner. Sloan Park’s largest bar is Dos Gringos, located beyond right field near the food trucks. Perpetually crowded and perhaps the largest bar in all of spring training, this is a favorite for younger fans who want to have a drink and get out of the sun. The lack of bar seating is understandable given the crowding. Other Arizona parks have also added “bars,” but they function as alcohol concession stands, not places to hang out. Overall, Arizona still has some catching up to do in this category. Before you roll your eyes, not all of these categories are created equal, but this is still worth discussing. This is something I value both personally and in evaluating a ballpark. While not a big factor in spring training, it was the demand for revenue generating premium seating that drove the ballpark boom, not warm retro architecture. And besides, just cross out the word “premium” if you want. Whether it’s a large group, a family of four, or a couple enjoying an afternoon outing, average fans want unique seating options too! Providing all-inclusive food, beer, and wine for the first two rows behind home plate, the exclusive Spectrum Dugout Club at Steinbrenner Field is unparalleled in all of spring training. Florida has the upper edge here. I think this is a classic situation where the renovated parks are forced to get creative, while the options at the newer Arizona parks are rather pedestrian, more commonly consisting of suites and group-only party decks. 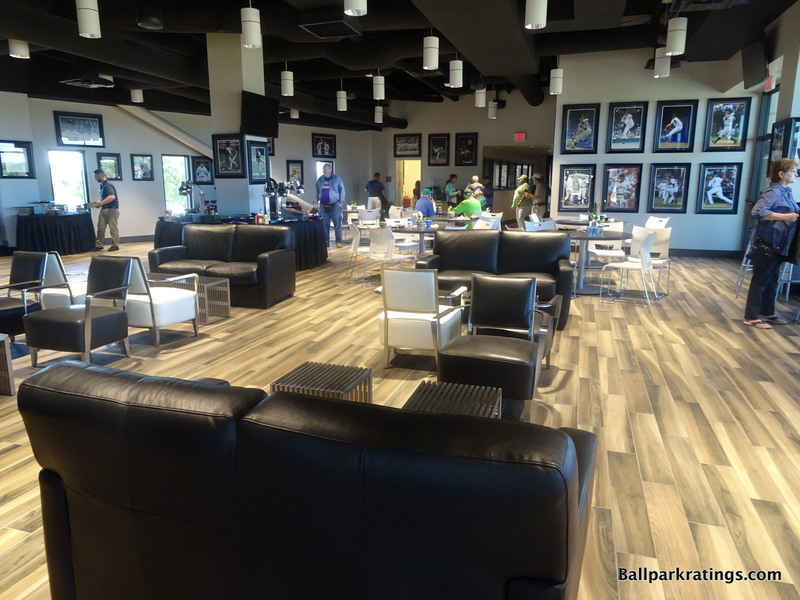 In Florida, we have more creative options like Steinbrenner Field’s dugout club, loge boxes, and cabanas. Other unique seating options include Publix Field’s Club 34, FITTAM Ballpark of the Palm Beaches’ field boxes, jetBlue Park’s monster seats, Spectrum Field’s VIP diamond dugout, Ed Smith Stadium’s Third Base Lounge, and a number of other parks with bistro tables and drink rail seating. All of these are pretty fan-friendly options, as opposed to corporate luxury suites and large party decks. There are a number of exceptions in Arizona. 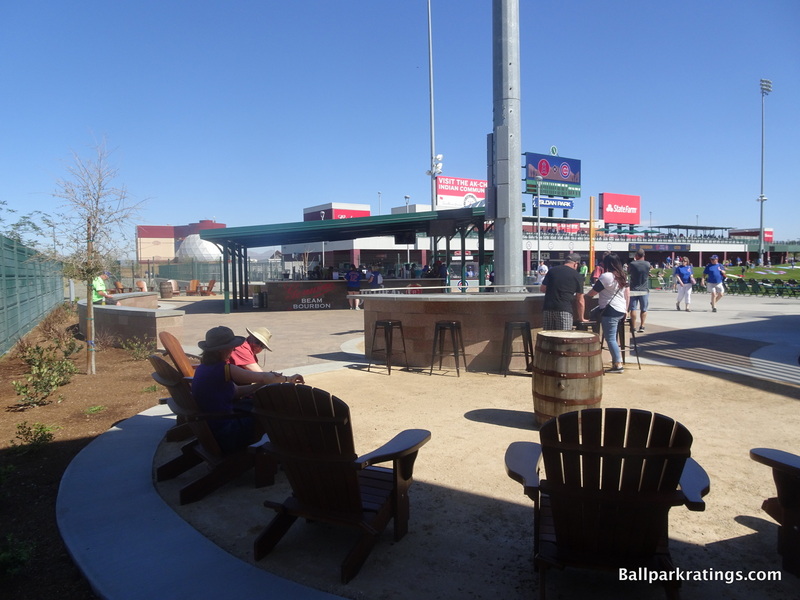 It’s another large group area, but the Pepsi Patio at Salt River Fields at Talking Stick is awesome, showcasing the best mountain views in spring training. Functioning more as a premium area in practice, Sloan Park’s Wrigley-style rooftops are fun. I also love the Charro Lodge at Scottsdale Stadium, which is more upscale than the usual rudimentary party decks, and it has individual tickets available for purchase. Finally, the club level at Peoria Sports Complex is excellent for spring training. The 34 Club at Publix Field at Joker Marchant Stadium, another all-inclusive premium option in Florida available for individual season or single-game purchase. Florida has closed the gap, but with all of the space, Arizona ballparks do a better job with kid-friendly spaces. In the last 15 years or so, spring training ballparks have become more holistic family-friendly experiences. Gone are the days of scouts and baseball fanatics sitting in wooden bleachers for 9 innings at a time for the sole purpose of seeing their team prepare for the season. Like the Major League baseball experience, these games have become family outings. With its mini-baseball diamonds and kid whiffle ball fields, Arizona generally excels in this category to a higher degree. Sloan Park, Goodyear Ballpark, and Salt River Fields at Talking Stick all have mini-baseball fields so kids can play ball at the game. Peoria Sports Complex has two such ball fields, which is pretty incredible if you think about it. In fact, Peoria Sports Complex is by far the most kid-friendly ballpark in spring training, lapping the field with a large pirate ship playground, speed pitch, and batting cages complimenting the two kid baseball fields. There is something for kids of all ages here. HoHoKam Stadium also has a playground, and a number of other Cactus League ballparks have speed pitch games. 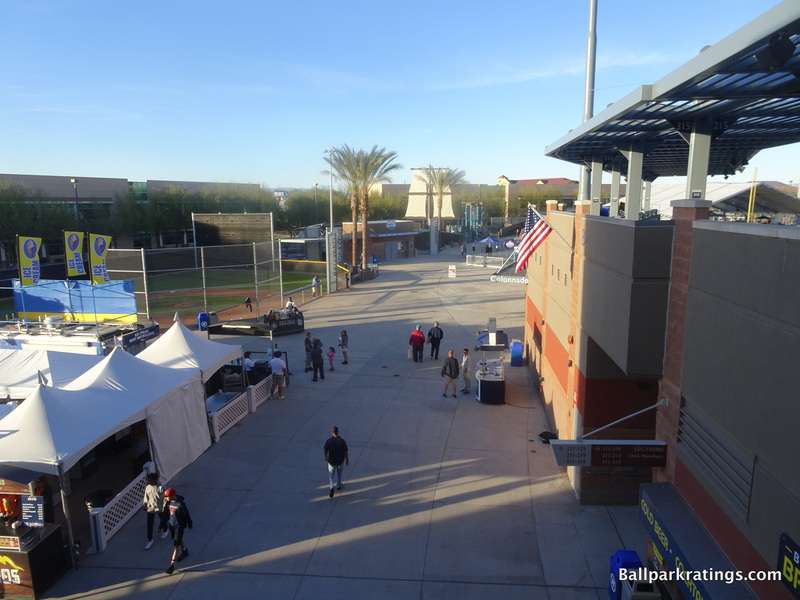 The fun-filled concourse at Peoria Sports Complex, with one whiffle ball field and the Pirate Cove playground seen in the distance. The Florida scene is much more subdued, with no mini-baseball diamonds. The Tigers’ Publix Field at Joker Marchant Stadium is probably the most extensive in the Sunshine State, with a pretty elaborate series of play areas including a bounce house. Charlotte Sports Park and Spectrum Field also have team-themed playgrounds. A number of other Grapefruit League parks have speed pitch. Overall, Arizona clearly does a better job in this department, even if it’s something we don’t emphasize too much. Baseball isn’t dying, at all, so we should put that myth to rest, but it is aging. With an average age of the baseball fan being 57, compared to 42 for basketball, creating memorable ballpark experiences for youngsters of all ages is vital for the continued viability of the game. Arizona has more consistent and hospitable weather. Although I don’t incorporate weather into the ratings system, it’s hard to deny this one. But you do have the beaches in Florida! In sum, the ballpark scenes in Arizona and Florida bring different assets to the table. Parks in Arizona are newer, more spacious, more centrally located, more aesthetically attractive on the inside, and are probably more fan-friendly overall. 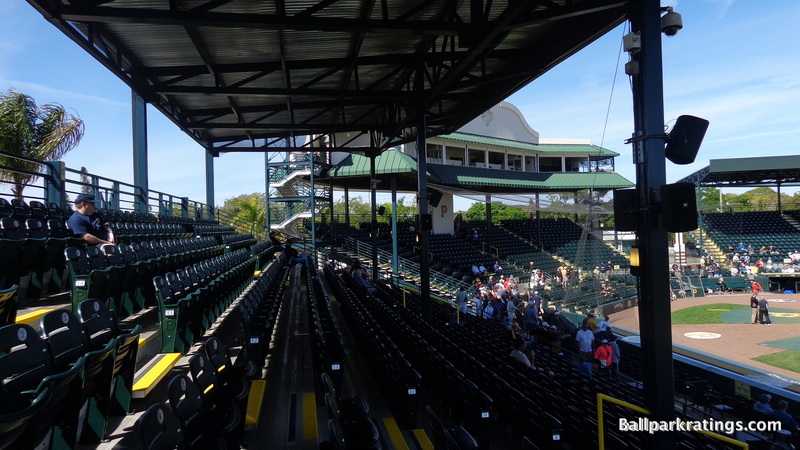 Ballparks in Florida are more intimate, have slightly better exterior designs, and generally have stronger amenities due to a series of renovations this decade. Most importantly, parks in Florida do a better job at representing the teams that play in them and bring a certain sense of history with their ballpark experiences, something that should not go unnoticed. Absolute equivalencies are almost always lazy, but I really do think the spring training experiences in Florida and Arizona are about equal overall. I can’t say I strongly prefer one state over the other in terms of spring training baseball. Of course, beyond just ballparks, it depends on which teams you root for, but we’re not looking at that. I hope those who stayed with me enjoyed reading this analysis. Because when you really dive into the details, the casual consensus that Arizona spring training is significantly better than that in Florida is unfounded.